Louisiana Lawmaker Threatens Saints' Tax Breaks After Anthem Protests State Rep. Kenny Havard wants to eliminate tax breaks and other state funding for the New Orleans Saints NFL franchise after some players joined the pregame national anthem protests. The New Orleans Saints kneel before the playing of the national anthem before the game against the Green Bay Packers at Lambeau Field on Oct. 22. "We're paying the Saints a lot of money to entertain us — not to get off in the weeds of, you know, political discourse," Havard says. "They can do that, but do it on their own time." The controversy started last season, when San Francisco 49ers quarterback Colin Kaepernick chose to kneel instead of stand during the national anthem in response to racial injustice and police brutality. Over the course of the 2016 season, other players joined Kaepernick's protest by kneeling, sitting or raising a fist during the song. Kaepernick was not offered an NFL contract in 2017, but the #TakeAKnee movement he sparked has continued without him. In September, President Trump entered the debate, saying in a speech and repeating on Twitter that the NFL should fire all players who refuse to stand for the national anthem. 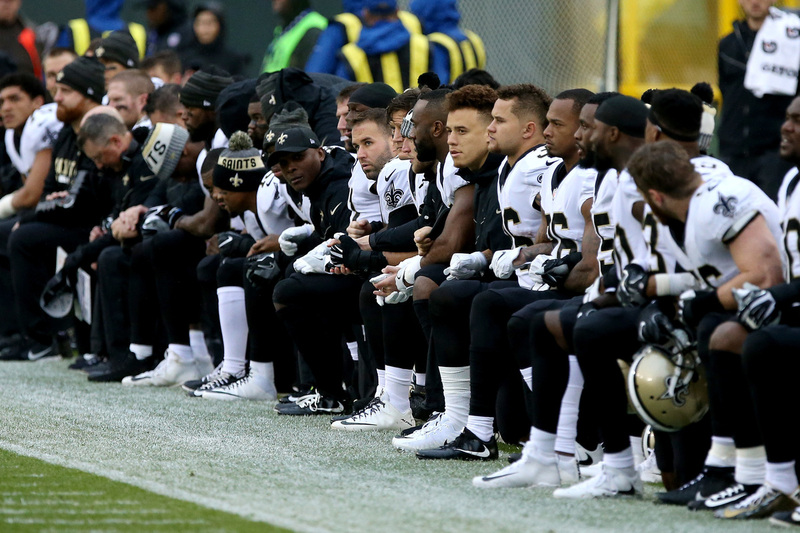 The president's comments only spurred more protests throughout the league, including by members of the Saints franchise. At the game after the president's tweets, 10 Saints players remained on the bench for the national anthem. Since then, the team has knelt as a group before the anthem and then stood for the actual song. Havard says removing the team's tax breaks has had bipartisan support in the past, when the conversation focused on the league's handling of domestic violence, concussion risk for players or team owner enrichment. But since the anthem protests began, he says, the tax debate is being perceived as a racial issue. "Look: Slavery was however long ago, and it was a horrible thing and no one should have to go through that," says Havard. "But it's time that we move on as a nation." Havard says he believes institutional barriers to equal opportunity are gone, and he rejects the notion of an unjust society. For him, the debate over standing for the national anthem is not about how police treat African-Americans, but a question of doing what is right. "When I see a lady coming, I open the door," he says. "When I sit at the table, I take my hat off. When the national anthem plays, I stand." State Rep. Ted James, a Democrat, rejects Havard's argument. "This is not a conversation about Saints players being political," James says. "This is a conversation about race." James represents a district in the state capital, Baton Rouge. That city became a flashpoint for the discussion about racial injustice in policing after the death of Alton Sterling, a black man who was shot by officers outside a convenience store there in 2016. No federal charges were filed in the case, and the state attorney general has not filed charges either. Then, less then two weeks after Sterling's death, three local police officers were killed and three others wounded in an ambush. James says that Baton Rouge did some tough racial reconciliation work after those events and that the debate over the anthem protests is reopening painful wounds. He is preparing for a legislative fight over the Saints funding issue. "As a black man and as a black player, you are telling these athletes 'go throw that ball, catch that ball, run that ball, tackle that quarterback, but you dare not say a word,' " says James. "That's a plantation mentality." The anthem protests have prompted NFL boycotts on both sides of the issue. Baton Rouge publisher and activist Gary Chambers joined the local protests after Sterling's killing. He says he has stopped watching the NFL in solidarity with Kaepernick's movement. "This man took a knee and flipped America upside down," says Chambers. Sitting in a Baton Rouge cafe, Chambers and a friend, businessman Geno McLaughlin, say the football players are giving voice to what African-Americans have been fighting for in communities all across the country, including their own. McLaughlin says how you view the flag and what patriotism means to you depend on your experiences as an American. "When I see the red stripes, I also see bloodstains," he says. "For me and for many black people ... we don't feel the same way about the flag that [a white person] might." He says that doesn't mean he hates the country. "My people, we built this country," he says. "So do I love the country? Absolutely." Chambers says Trump's inflammatory public statements and tweets about firing the players send a clear message. "Trump is basically telling all the other slave owners 'keep your Negroes in check' is what I hear," says Chambers. 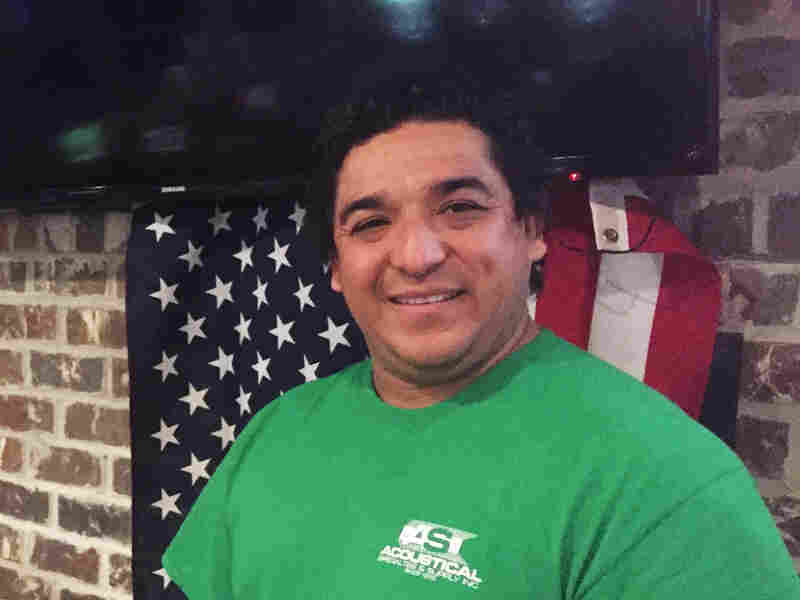 Tony Melera, manager of Sarita's Mexican Grill & Cantina, stands in front of a American flag — a gift from state Attorney General Jeff Landry — draped over the New Orleans Saints 2017 game schedule. About 25 minutes outside Baton Rouge, the player protests have sparked a boycott from the opposite perspective. At Sarita's Mexican Grill & Cantina in Denham Springs, nearly 50 big-screen TVs line the walls. Manager Tony Melera says diners can watch golf, pro wrestling and the Weather Channel, but never professional football. The restaurant has banned NFL games. "There's a time to protest," Melera says. "They have the right to do so. But don't take it out on national television against the flag." Melera, an immigrant from El Salvador, says the protests on the field send the wrong message. "We respect the flag. We stand. And we pledge allegiance," he says. "They make a lot more money than we do. Why do it? They're going at it the wrong way." Melera says the restaurant lost some business at first; people in Louisiana take their football seriously. But Melera says they've also picked up new customers who support the boycott. Louisiana Attorney General Jeff Landry even gave the restaurant an American flag that now hangs over the New Orleans Saints schedule that had been posted in the bar. The state Legislature will take up the tax break question when it reconvenes in March, in the meantime, the issue is also now in the courts. Just last week, a Saints season ticket holder sued the team for a refund, claiming he has been damaged by players using football games as a platform for protest.